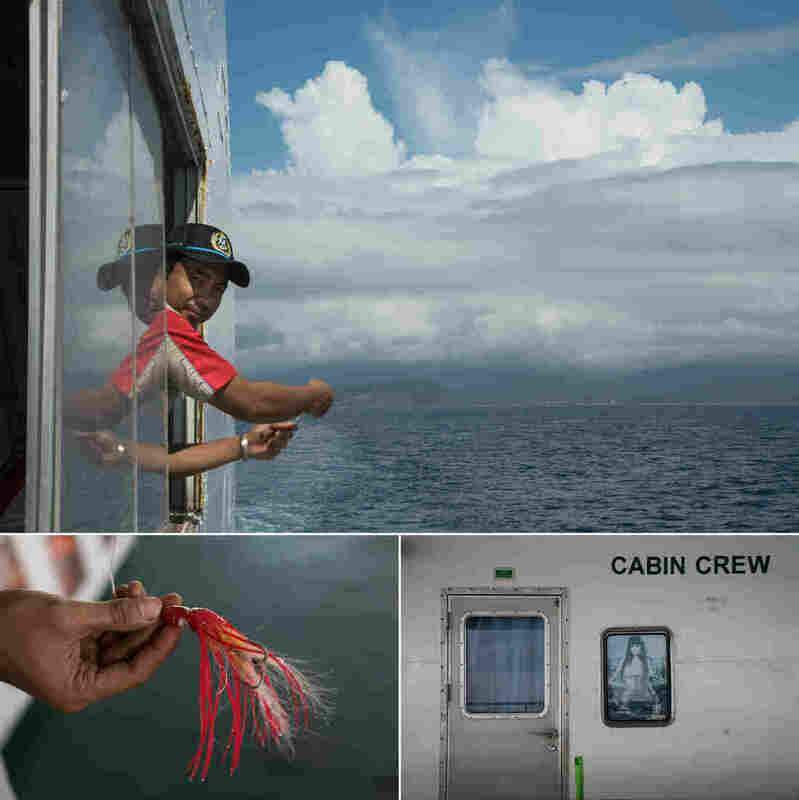 PHOTOS: A Tranquil Ferry Between Indonesian Islands : Parallels The public ferry system is a key link for a diverse nation spanning some 17,000 islands. 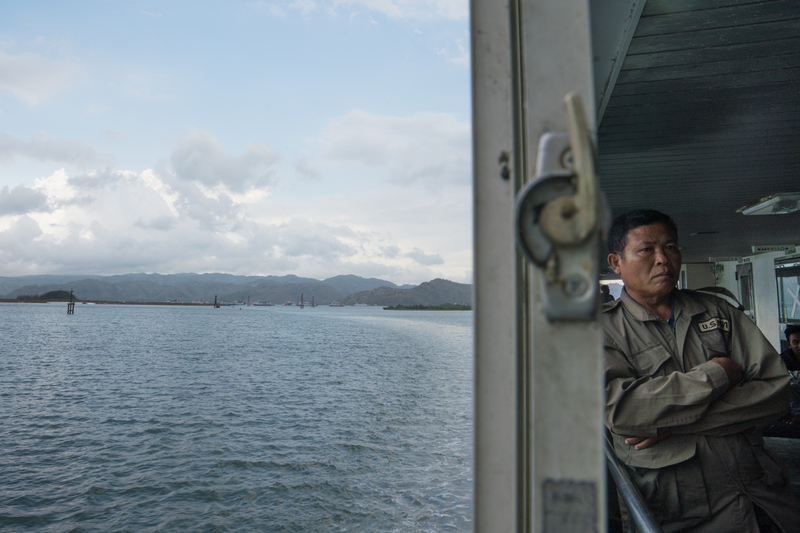 "We serve all the people," says the captain of a ferry linking majority-Hindu Bali with majority-Muslim Lombok. A man gazes out at the water during a four-hour journey from Bali to Lombok. The public ferries are a key link for a nation spanning some 17,000 islands. The slow ferry churns over the waves between Bali and Lombok, two islands of the 17,000 or so that make up Indonesia. 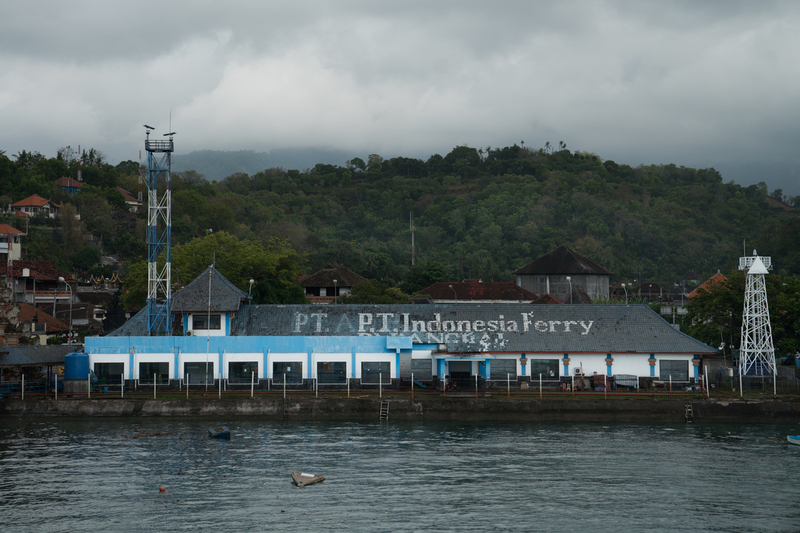 The public ferries of Indonesia are part of the connective tissue that keeps this diverse country together. Religious and ethnic tensions have no place here. 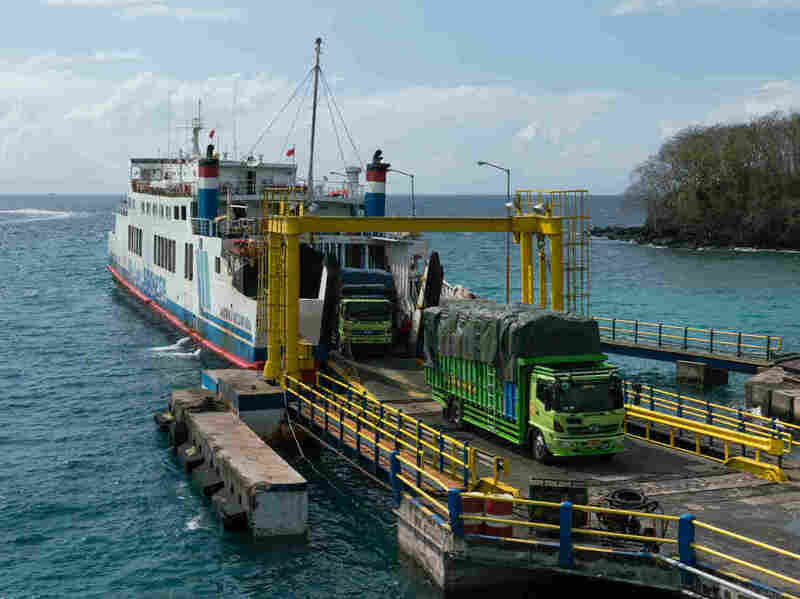 The ferry between Bali and Lombok transfers people and goods from one island to the next. Most tourists prefer taking faster boats. "I serve all the people. It doesn't matter if they come from another religion or another tribe, we serve all the people. It's equal," says ferry Capt. 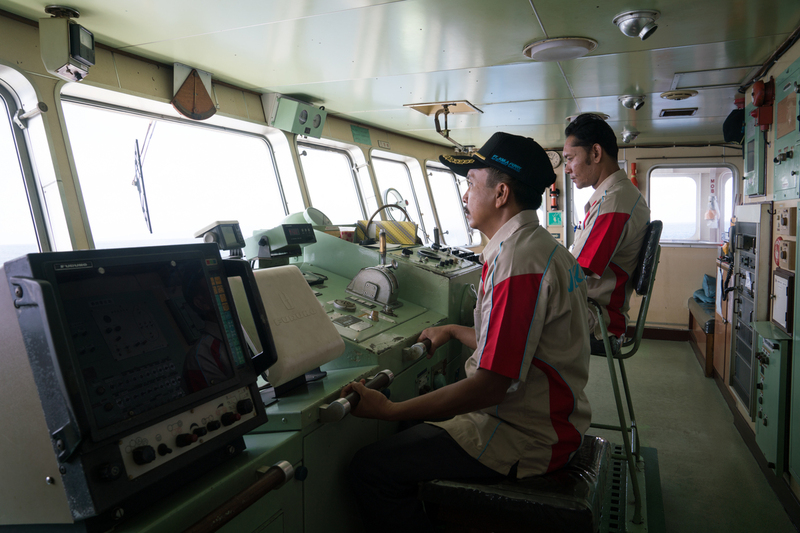 Mulyono, steering the Jemla ferry from majority-Hindu Bali to majority-Muslim Lombok. A ferry crew member walks from the truck level to where the passengers sit. The journey of almost 50 miles costs $3.40 and takes about four hours, sometimes longer. Tourists favor the more expensive fast boat that takes less than half the time, but the passengers on this vessel are almost all local — doing business, visiting relatives, going on vacation. Inside the hold of the ferry, passengers rest while a movie blares on the screen. Between the islands, with little to no cellphone reception, people put aside their regular lives and spend the ride at ease, dozing or gazing into the deep blue water of the Bali Sea. Conversation is minimal. The island of Lombok can be seen in the distance as the ferry continues the four-hour journey from Bali. Songbirds chirp in their cages as a storm moves toward the ferry. 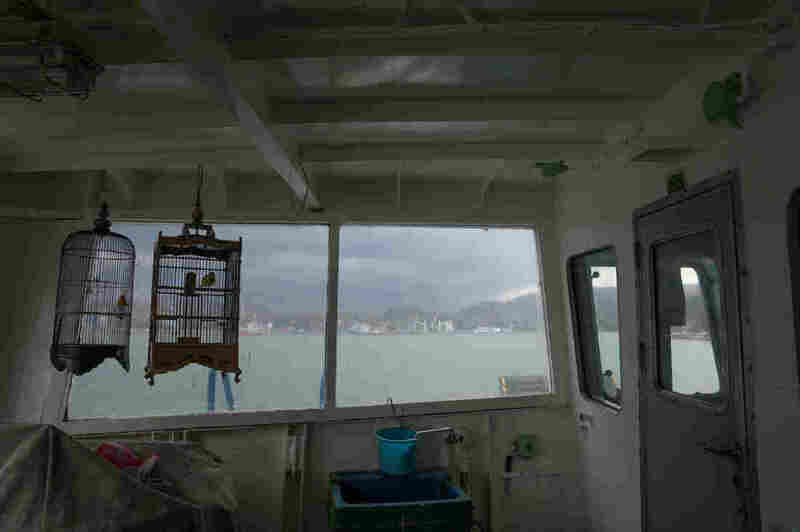 At the front of the boat, next to the captain's quarters, hang a slew of ornate bird cages. Gentle chirps weave their way into the web of sounds. 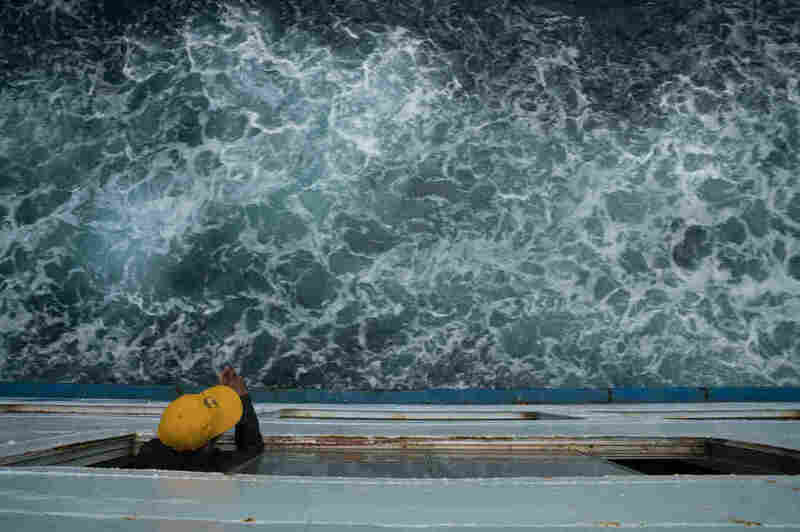 Waves slap the hull rhythmically, and the engine drones, loudly. Ferry Capt. 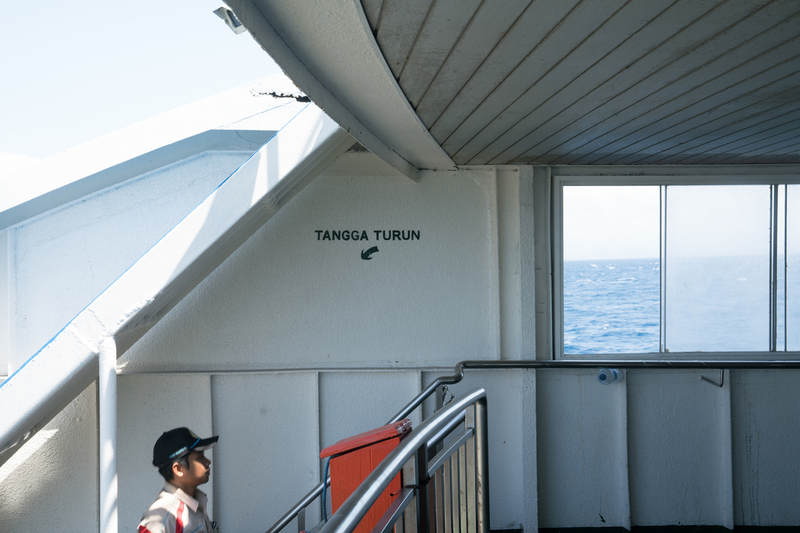 Mulyono (left) and a colleague look out the front of the ferry on its way to Lombok. "We serve all the people," Mulyono says. 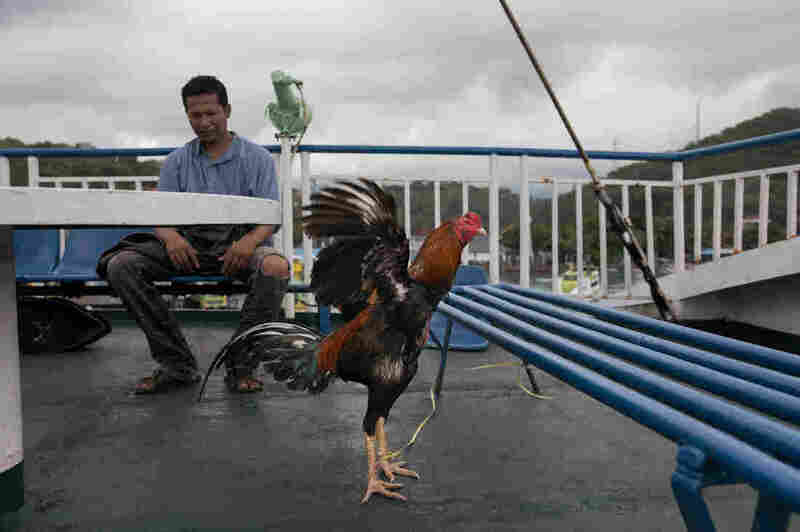 Rambo the rooster is tethered on the top deck, on his way home from Bangkok. Arif Rahman, who works for a delivery agency, transported Rambo and another cockfighting rooster for breeding purposes. Juraidah, 27, works in Taiwan to support her family and hasn't been home in three years. Her father died while she was gone and she is returning for two weeks to visit her mother and other family members. 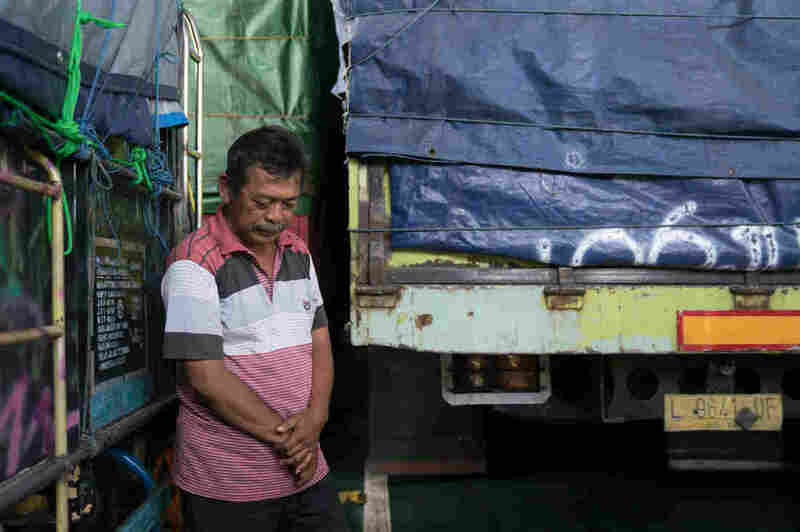 Rahmat, 53, is transporting a truck full of chips to Lombok. 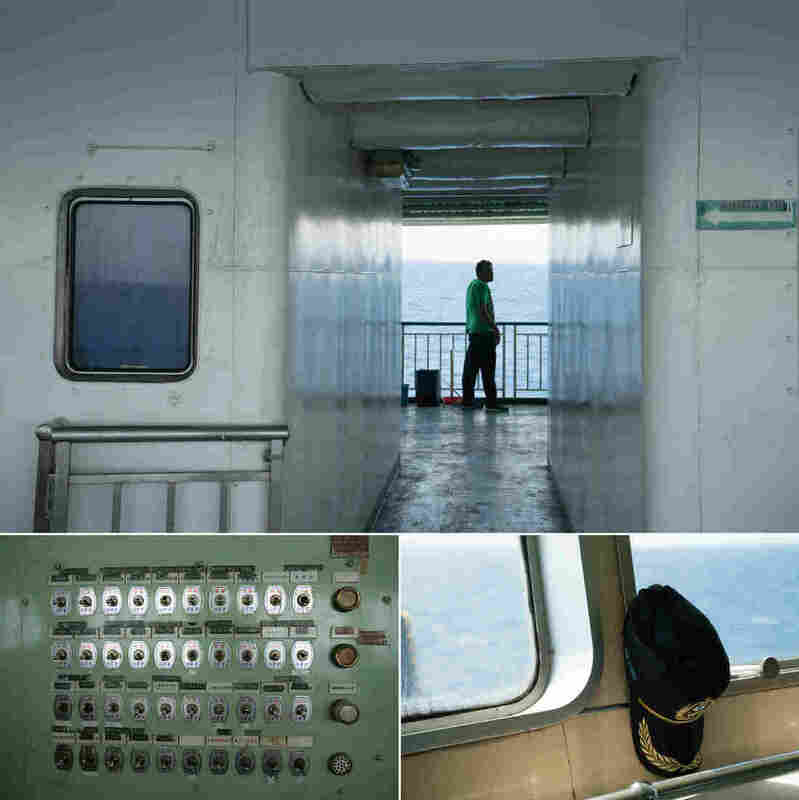 He travels by ferry about once a month from East Java, where he lives. 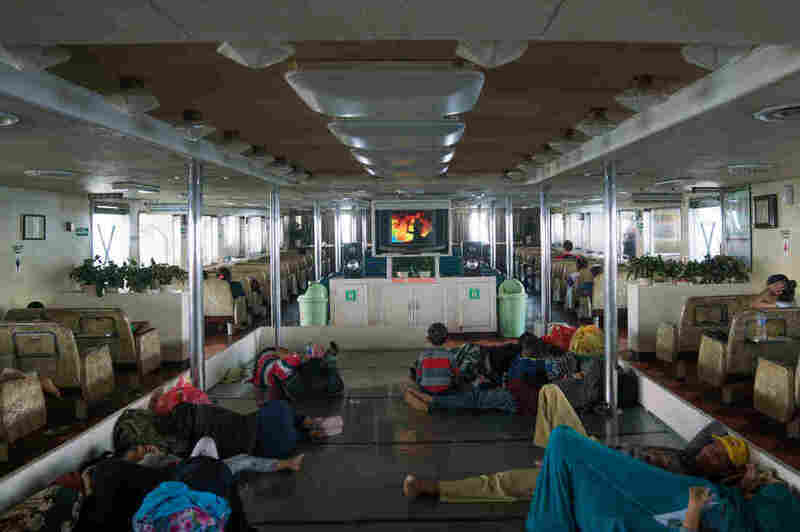 The repetition of noise dulls the senses and some passengers drift toward sleep, arranged in a jumble of limbs, napping on the boat's hard plastic benches. Others drink heavily sugared coffee, slurp cups of instant noodles, and smoke through packs of clove cigarettes. 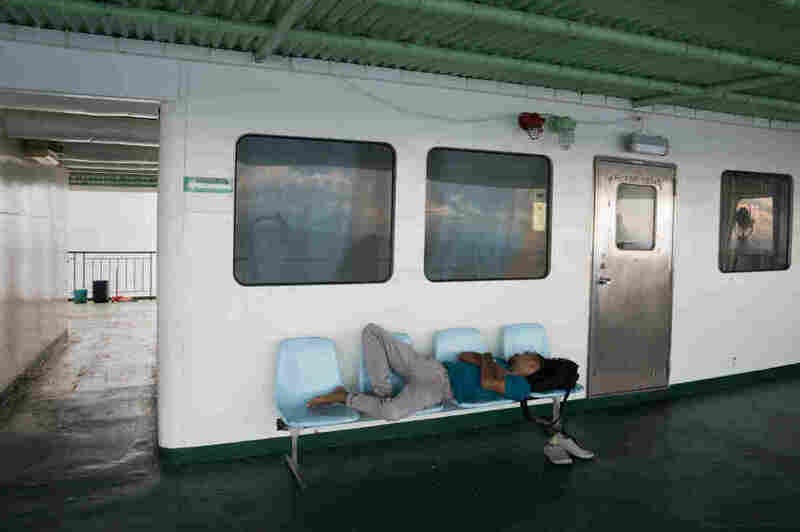 The hum of motors and rocking of the ferry lull passengers to sleep, despite the plastic benches. 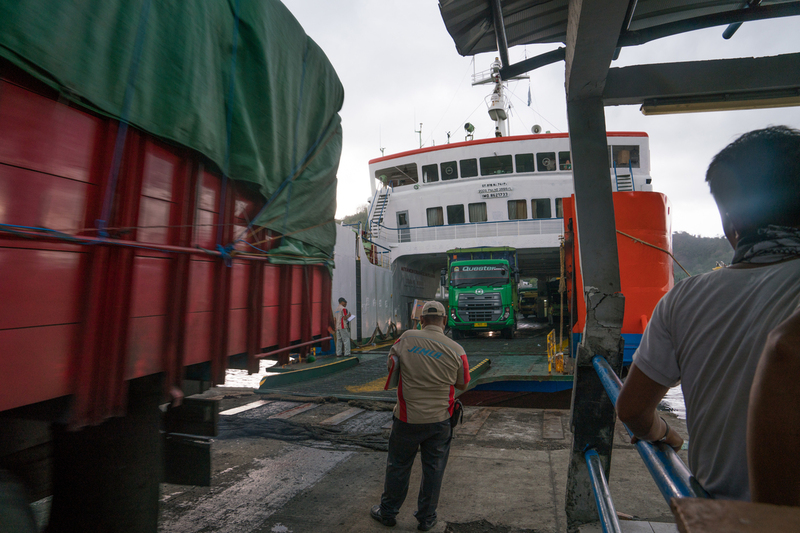 Ferry employees guide trucks off the ferry in Lembar, a port on Lombok. 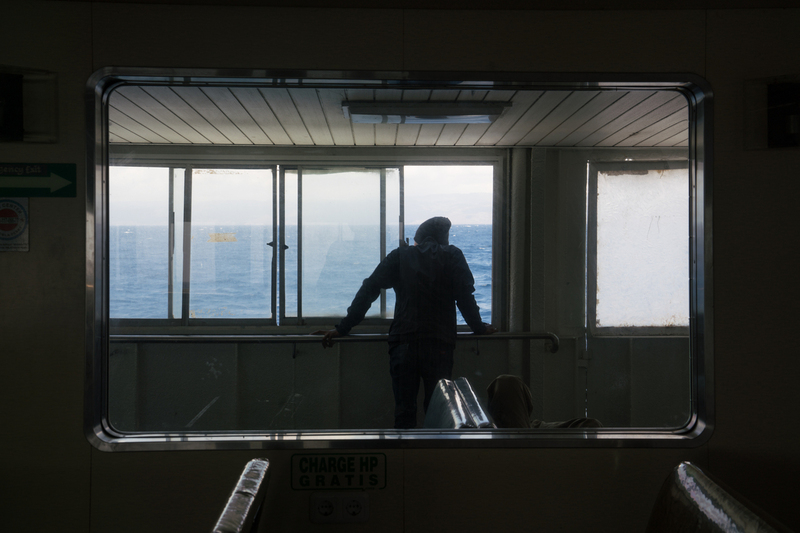 A man stares out at the water as the ferry traverses the nearly 50 miles between stops. Juraidah, a 27-year-old migrant worker from Lombok who lives in Taiwan, is on her way to visit her family. "My father passed away," she says. "It's only my mother, and that's why I have to earn money for my big family." 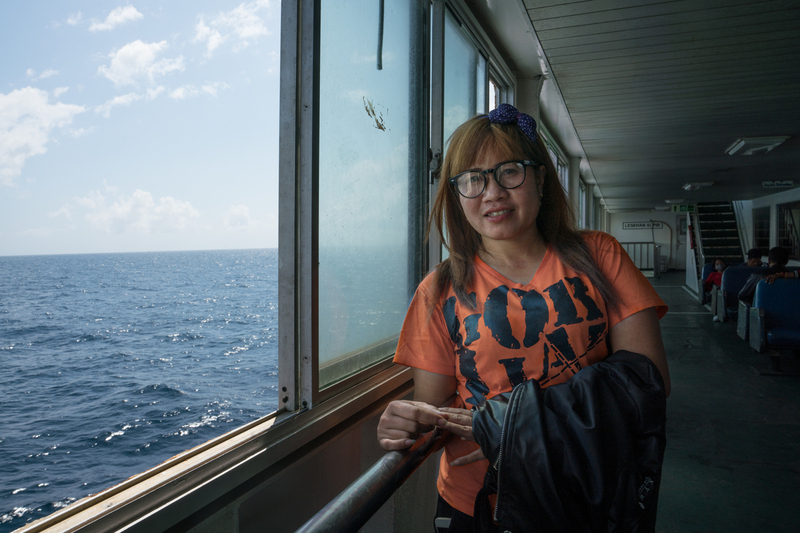 Taking this ferry for the last leg of her journey helps her save money. She hasn't been home in three years. Her father died while she was gone. As the ferry pulls in to dock in the south of the island of Lombok, Juraidah and the other passengers gather their belongings, and prepare to go their separate ways.